You will find all FOXPRO sounds available below. Go through and place a check next to each sound that you would like to have featured in the game call. Note: Selecting custom sounds is easier from a desktop computer. Regular 355 Cal Taylor Cottontail Dist. Regular 332 Screamin Blue Jay Dist. The FOXPRO TurkeyPro gives you the ultimate advantage while chasing down that elusive ol' tom. The unit comes with 28 turkey sounds, 17 predator sounds, and holds 300 sounds total. The TurkeyPro uses a single, high-efficiency Mylar cone speaker. Connect an external speaker to the jack on the side of the call for even more volume. In turkey hunting, it is common for that gobbler to hang up on you. Additional TurkeyPros can be placed strategically behind you to coax that gobbler into your range. The system controls up to 3 TurkeyPro units from one remote for directional advantage. The TurkeyPro remote features an elastomeric keypad for effortless use, even with gloves. It also has category files for easy navigation through sounds. The remote has a power on/off switch, volume up/down buttons, scroll up/down buttons, a mute, and much more. The TurkeyPro is backed by a 3 year limited warranty, FOXPRO's unmatched customer support, and is proudly made in the USA! Please be aware that not all states allow the use of an electronic call for turkey hunting. You will need to contact you local Game Commission to check the legalities in your state. The table below has item numbers and descriptions corresponding to the images displayed to the right. This is to help you become familiar with the TurkeyPro and the features. The table below has item numbers and descriptions corresponding to the image displayed to the right. This is to help you become familiar with the TX433 and the features. Preinstalled on unit at factory. Dimensions 7.5" x 3.75" x 5"
Dimensions 8.5" x 3.5" x 1"
For optimum performance, FOXPRO recommends the use of rechargeable batteries for powering your game calls. 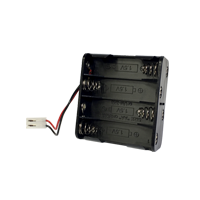 This kit includes 8 'AA' low-self-discharge rechargeable NiMH batteries and a standard 120VAC wall charger. This charger connects to a 12V cigarette lighter port and provides a full charge of (8 AA) NiMH batteries in three hours or less. Available separately is the Fast Charger AC Wall Adapter which will allow you to charge your batteries on standard 110V (household current). This premium lanyard is perfect for wearing around your neck and securing your transmitter, plus six hand calls in the field. Note: transmitter and hand calls not included. Tripod Bracket for use with the BuckPro, Turkey Pro and Moose Elk Pro. This item will also come with two screws for mounting to the back side of the caller. This item will be available for shipment soon Protects your caller while in transit, keeping everything together and in its place. Includes a remote control side pouch to provide a safe and convenient place to store your remote transmitter. No reviews for this item. Be the first!